Pantoprazole is used for treating symptoms of gastro-esophageal reflux disease (heartburn, back flow of acid from stomach, difficulty in swallowing), inflammation of esophagus, excess acid secretion by stomach (Zollinger-Ellison syndrome), in prevention of intestinal or stomach ulcers in patients caused by prolonged pain killer use. 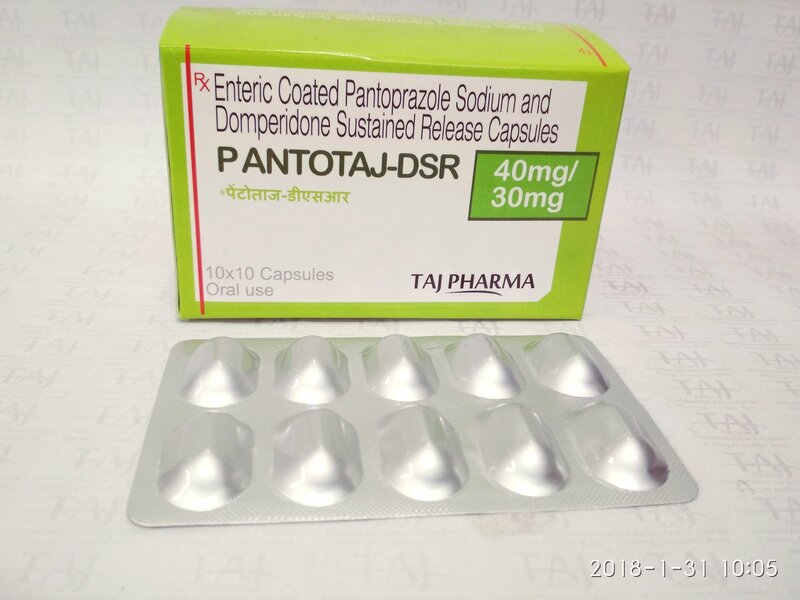 Pantotaj-DSR is a combination of Pantoprazole and Domperidone. Pantoprazole inhibits the H + /K + – AT pase enzyme, which is responsible for gastric acid secretion in the parietal cells of the stomach and irreversibly block the final step of acid secretion. It increases motility of GI tract by inhibiting the action of dopamine and fastens gastric emptying. The recommended dose for Pantotaj-DSR is one capsule daily preferably before breakfast.